Liz Moore & Associates has a team of sales specialists who are dedicated to helping investors build wealth through their real estate portfolios. 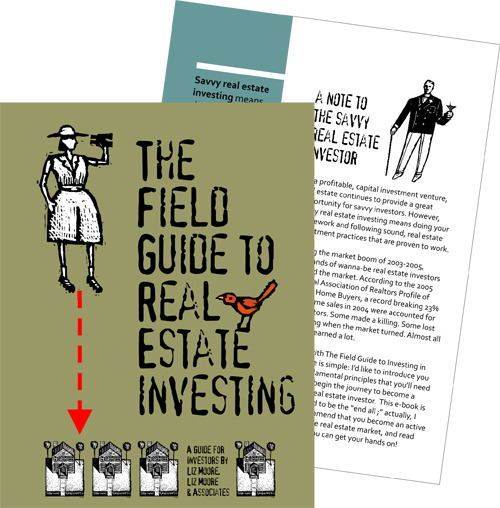 In response to client demand, Liz has authored The Field Guide to Real Estate Investing, a 16 page e-book which was created to give first time investors an idea of where to begin. The e-book is free, and can be downloaded atwww.TheSavvyRealEstateInvestor.com, or by clicking the button below. The website is a content rich resource, offering tips and articles galore to experienced and “wannabe” investors alike, all the way from Williamsburg, to Hampton and Newport News, VA. In addition to downloading the e-book, visitors can take a quiz to determine their level of investment savvy, check out our “must know” investor websites, explore potential investment returns with our deal analyzer calculator, read articles by local attorneys, lenders, realtors and tax professionals, or even Ask a Guru about creative financing options for investment! Our site also offers the ability to search foreclosures, short sales, and REO properties in Newport News, Hampton, Poquoson, Yorktown, Gloucester, Smithfield, Williamsburg and James City County. So, if you are wondering if now is the time to begin to build your financial portfolio through savvy real estate investments, we have the PERFECT place for you to begin! Click below to download your copy of The Field Guide to Real Estate Investing.